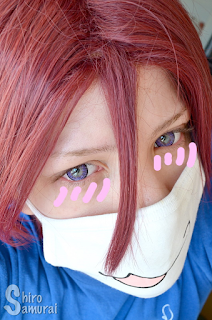 These lenses are the MAX Elegance Tri-Tone Violet that I bought from HoneyColor a while ago. As far as I know these lenses are exclusive to their site so yeah, if you want to try these then that's where you should be looking! 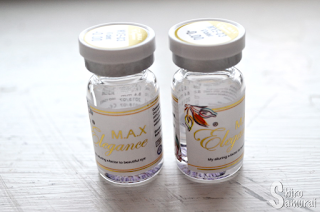 Okay so, I think most people are unfamiliar with the MAX brand of lenses –or M.A.X– as it's spelled on the vials. My guess is that the name MAX stands for My Alluring X-factor (to beautiful eye) because that's what's written on the label. 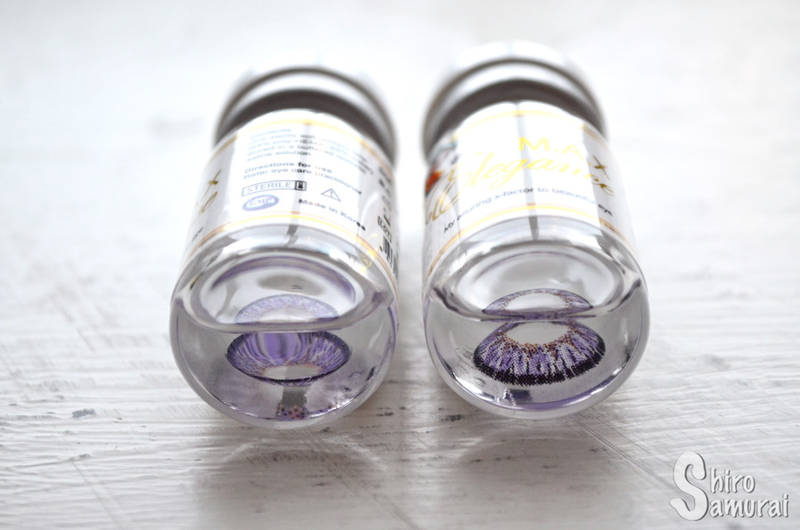 I bought these lenses out of curiosity and because they were on a 50% off sale back then. Lens on my finger with "wrong side" showing. Different indoor lights. I don't know exactly where or what but these lenses have a design that I'm sure I've seen on another pair of contacts before – or at least a veeeery similar one. Then again, the print of these is rather generic I'd say; not like it's bad but yeah, I mean it in the way that it doesn't really stick out because there's several other lenses out there that looks the same. All photos taken by me during a February morning with a clear sky. There's no color filters or such on the close-up photos and that's so that the colors would be as true to real life as possible. One lens in. This is to show enlargement. Facing window in my apartment. Facing the sun directly, through the window. Room light in my apartment. I'm standing next to a weak yellow lamp. The color is a nice medium or light violet that shows up quite well. 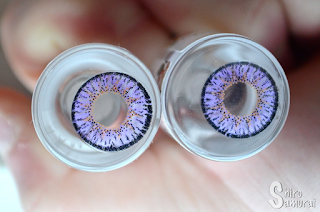 The lenses have a star shaped brown design towards the pupil hole, along with small black dots in the same shape; I think this is done to make them blend in a bit better with whatever natural eye color that the user has – I have light blue-gray eyes, with an occasional greenish tint. The design is kinda generic but it's still nice in all its simplicity. The black limbal ring is narrower than on most lenses and it has an irregular "cracking" effect instead of being a fully covering bold ring; this makes the lens and the enlargement effect look more modest and not as unnatural. The issue with these lenses is the comfort. I am highly suspecting that the right lens is defective; I've tried wearing it 5 times but every time it feels like I have dirt between my eye and the lens and it feels horrible!! The lens gives a really unpleasant scratching feeling and it makes my eye water like crazy as soon as it has settled on my pupil. It's seriously horrible to wear and I've tried cleaning and inserting it multiple times and it always feels the same. :/ I threw it away as soon as I was done taking the photos and yes, this is the reason why there's fewer pictures than normal – I just couldn't stand wearing the hurting lens at all. It seems though like the other lens (left one) is okay to wear but it feels kinda "thick" in my eye and it feels uncomfortable at first too, although not in any painful way – just the usual "I have a lens in my eye" feeling, which I dislike. I haven't tried wearing it for long but I guess I could stand wearing it for probably 2-4 hours or so. Please note though that I have dry/sensitive eyes and that comfort of each pair of lenses can be really different from person to person. Want to see other colors? Nice light to medium violet color. Basic-looking circle lens design but it's still nice in all its simplicity. 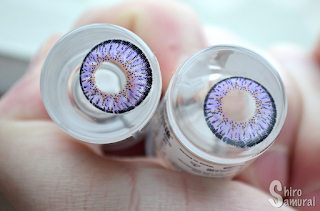 The colored parts of the lenses are more opaque than I was expecting – they change my eye color nicely. They do look sorta big but it's nothing crazy that grabs instant attention to your eyes. Comfort is really poor, mainly because I suspect one lens is defective; it feels like I have constant dirt in my eye and it's just reaaaaally unpleasant to wear and makes my eye water like crazy. The left lens seems okay but it's not really comfortable either – I feel it in my eye and it feels "thick". Comfort for the non-defective lens is around 5/10. Too big and pigmented for being realistic. Also, violet is not a natural color to begin with, lol. Närcon Vinter 2016 – I'm addicted to bubbletea! Battousai Kenshin – Pimpin' up the wig!